Southern Railway trains. Image from the State Archives. On January 4, 1856, a train accident on the Wilmington and Manchester Railroad occurred near Wilmington, giving rise to an enduring North Carolina legend. In the neighborhood of Hood’s Creek, about 8 miles outside of Wilmington, the locomotive on the night mail train was using steam faster than new water could be pumped into the boiler. 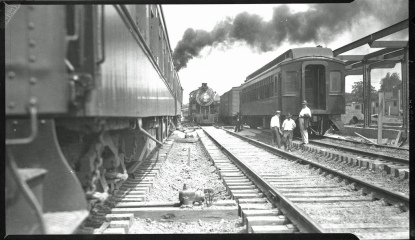 The mechanical pump only worked when the wheels were turning, so the crew uncoupled the engine and ran it ahead to pump water without the heavy train attached. Upon returning to their train, they couldn't see it in the dark and collided with the first car, throwing Conductor Charles Baldwin from an open door. Baldwin received severe head injuries during the accident and died three days later. He is buried in Oakdale Cemetery. In determining the cause of the accident, investigators discovered that Baldwin was responsible for hanging a light on the front of the mail train and had not done so. The Legend of the Maco Light that subsequently grew from the accident recounts the tale of “Joe” Baldwin, a train conductor who was decapitated in a collision. A mysterious light seen frequently along the railroad tracks at the small crossroads was reputed to be Joe Baldwin swinging a lantern as he searched for his head. The light could be seen from a distance but disappeared as one approached it. The railroad tracks were removed in 1977, and the light has not been seen since. Learn more about the Legend of the Maco Light and other North Carolina lore in North Carolina Legends from N.C. Historical Publications.